Tappan Zee Constructors connects the cable-stayed main span to the Westchester approach. The project’s largest crane, I Lift NY, went back to work this weekend to install a critical section of structural steel on the New NY Bridge project. 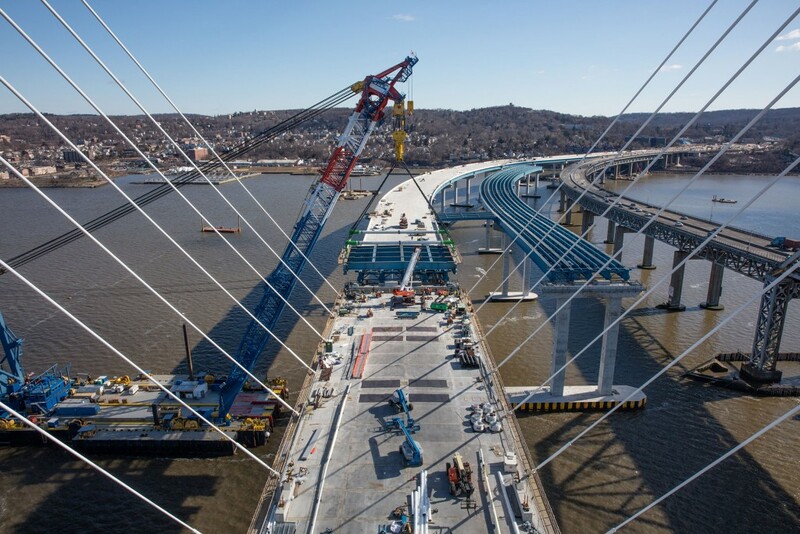 The segment is the first connection between the cable-stayed main span and the pier-supported approaches, marking another major accomplishment for the project team. Weighing 750,000 pounds, the steel section was prepared off-site at the project’s Tomkins Cove facility, allowing Tappan Zee Constructors to accomplish most of the assembly work on land, rather than over the water. It was then barged directly to the project site for installation. The operation lasted only a few hours, with the section successfully placed between the westbound main span and Westchester approach. TZC will follow with another connection between the westbound main span and the Rockland approach in the days ahead. Each 95-foot-wide steel section will be connected to the main span towers with six stay cables, which will be anchored and tensioned. TZC will also install precast concrete deck panels on the steel sections to provide a base driving surface. In the coming months, the project team will complete the westbound main span with additional sections of structural steel between the main span towers.